BURBANK, CA – March 10, 2017 – Available wherever music is sold and streamed, the “Beauty and the Beast” original motion picture soundtrack features an unforgettable score from eight-time Oscar®-winning composer Alan Menken along with new recordings of the original songs written by Menken and two-time Academy Award® winner Howard Ashman. Also included are three new songs written by Menken and three-time Oscar winner Tim Rice. The story and characters audiences know and love come to spectacular life in Disney’s live-action adaptation of “Beauty and the Beast,” a stunning, cinematic event celebrating one of the most beloved tales ever told. Directed by Bill Condon from a screenplay by Stephen Chbosky and Evan Spiliotopoulos based on the 1991 animated film, “Beauty and the Beast” stars: Emma Watson, Dan Stevens, Luke Evans, Kevin Kline, Josh Gad, Ewan McGregor, Stanley Tucci, Gugu Mbatha-Raw, and Audra McDonald with Ian McKellen and Emma Thompson. “Beauty and the Beast” opens in U.S. theaters on March 17, 2017. From early on, one of Condon’s key objectives was to build upon the story from the animated classic, and the Oscar-winning director realized music could play a significant role in making that happen. By finding interesting variations on beloved songs like “Be Our Guest” and “Gaston” and with the addition of new songs, music could help push the story forward while elevating its emotional content at the same time. New songs featured in the film and included on the soundtrack are: “Evermore,” a soaring ballad performed by the Beast (Dan Stevens); the heartwarming “Days in the Sun,” sung by Belle (Emma Watson), the Beast and the castle’s enchanted staff; and “How Does a Moment Last Forever,” sung by Maurice (Kevin Kline) and in a reprise, by Belle. The “Beauty and the Beast” original motion picture soundtrack features 19 tracks and is available wherever music is sold and streamed (http://disneymusic.co/BeautySndtrkP, http://disneymusic.co/BeautySndtrk, http://disneymusic.co/BeautySndtrkWS). 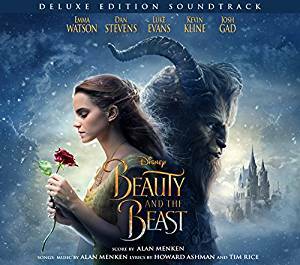 The Beauty and the Beast two-disc deluxe edition and the digital deluxe edition soundtrack, which are also available March 10, feature additional tracks including score, demos and outtakes.